These ergonomic keyboards are an effective way to prevent over-reaching while typing and using a mouse, which can cause upper limb disorders such as RSI. These keyboards don't have a numeric keypad on the right and there is a very good reason for this, the numeric keypad has been removed to allow the mouse to be brought in closer to the body, creating a more neutral position for the shoulder and elbow. Wider keyboards may cause the arm that operates the mouse to extend unduly, resulting in shoulder discomfort. Split keyboards allow the angle of the keys to be adjusted to an optimum position. Creating the perfect angle for your arms and wrists. It is worth looking at adding an ergonomic mouse to partner the keyboard to maximise the benefits. There are many mini keyboards available, but we find the Bakker mini keyboard to be one of the best, primarily for its ergonomic benefits. 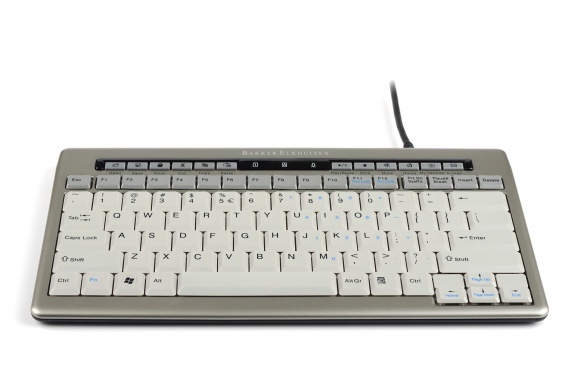 Less wide than a conventional keyboard, it encourages neutral posture for the arms and shoulders. The soft, deep operating keys on the Bakker keyboard minimises aggravation to the ligaments and tendons, in the hand and forearm. The anti-glare surface will help reduce eye strain for non-touch typists. The Bakker has a slim curved edge design that makes it an attractive addition to your desk hardware.